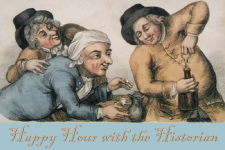 Join us on the lovely evening grounds of Graeme Park (indoors in cooler/inclement weather) for a few drinks, munchies, and 30-40 minute talk on a topic of historical interest. $5/cover charge; cash bar and food. No cover charge for members. Bar opens at 6 pm, lecture starts at 7 pm. According to her biographer, Anne M. Ousterhout, there is no known evidence that Elizabeth Graeme Fergusson attended the theater in Philadelphia. At the same time, we know that Elizabeth attended concerts in the city, was a poet herself, and was a supporter of the literary arts. There is evidence that Elizabeth attended plays while in London and we know that Prince of Parthia, a play written by her childhood friend Thomas Godfrey, Jr., debuted (posthumously) in Philadelphia in 1767. Oursterhout suggests that because of her friendship with Godfrey, Elizabeth likely attended. Tonight’s presentation will explore the history of theater production in colonial Philadelphia from the establishment of Pennsylvania in 1681 to 1800 when the new nation’s capital moved to what became Washington, D.C. Although Philadelphia was the largest city of the time and relatively cosmopolitan, not all of its residents (including some of the nation’s most famous founders) were admirers of the theater. Evidence suggests theatrical productions were staged by the British in Philadelphia and by Washington’s troops at Valley Forge during the winter of 1777-1778, even though theater productions were proscribed by the authorities. Join us tonight to hear more about the plays and players of Philadelphia’s colonial past. Dr. Steven Griffith taught theater in colleges in Georgia, Minnesota, and Iowa for over 30 years. He has designed for over 150 theatrical productions. His special theatrical interest is Irish drama. Steve has been a volunteer with The Friends of Graeme Park since 2016.